Doug Brown P.V.A. Memorial Pheasant Hunt-S.D. Eric Brandreit- Team O-A S.D. Freshwater Fishing Hall of Fame-WI. Gavins Point Dam-NE. & S.D. 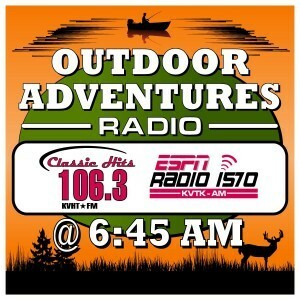 The award winning Outdoor Adventures radio program airs Monday through Saturday at 6:45 am in Southeastern South Dakota, Northeast Nebraska and Northwest Iowa on KVHT Classic Hits 106.3 FM, EPSN Sports Radio KVTK 1570 AM and in Northwest Iowa on KCHE 92.1 FM as well as on line at www.kvhtradio.com and www.kvtk.com. Outdoorsmen Adventures TV was live.